1. The jogging trails are great! 3. They have a wonderful hot tub, perfect for post-race recovery! One of my good friends, Kim Dillen, ran the trail at Disney’s Fort Wilderness Resort just last week and she loved it. Her and her daughter saw wild life and explored the resort on the 2.5 mile trail. You can choose between the 2.5 mile pathway through the resort or the .75 mile shaded fitness trail. Honestly, I love just running through the campground and cabins and exploring the entire resort. 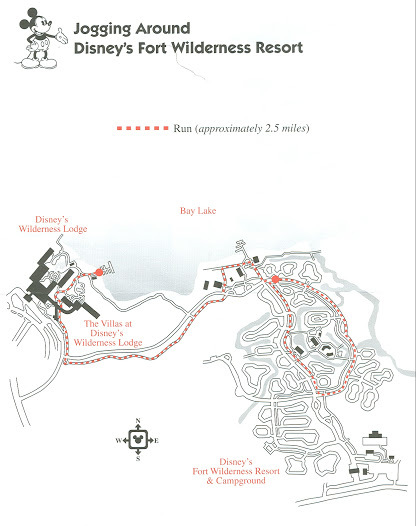 There is not a lot of car traffic at the cabins and guests are encouraged to walk or take the bus, so the entire resort is runner-friendly. Image retrieved from Healthy Dose of Pixie Dust.